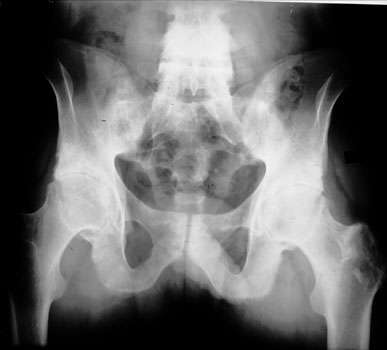 An AP radiograph of the pelvis shows classic changes of ankylosing spondylitis. Note that the sacroiliac joints are obliterated bilaterally with osseous fusion. In addition, there is joint space narrowing of both hips, concentric in nature, which is similar to rheumatoid arthritis in the distribution of joint destruction. However, note that there is extensive sclerosis of both the femur and the acetabulum as while as large collar osteophytes. This differs significantly from rheumatoid arthritis. Inflammatory sclerotic changes of the large bones are common in patients with ankylosing spondylitis.